Have you ever been excited to wake up just so you can have breakfast? That’s me. Every. Day. When I started lowering my sugar intake, the first and hardest thing to change, was my breakfast ritual of a bowl (okay, more like two) of Special K.
I was majorly addicted, and even after two generous bowls of the stuff, I’d be starving by mid-morning and i was also suffering from terrible migraines. So out it went, and in came the toast with peanut butter and eggs with avocado. 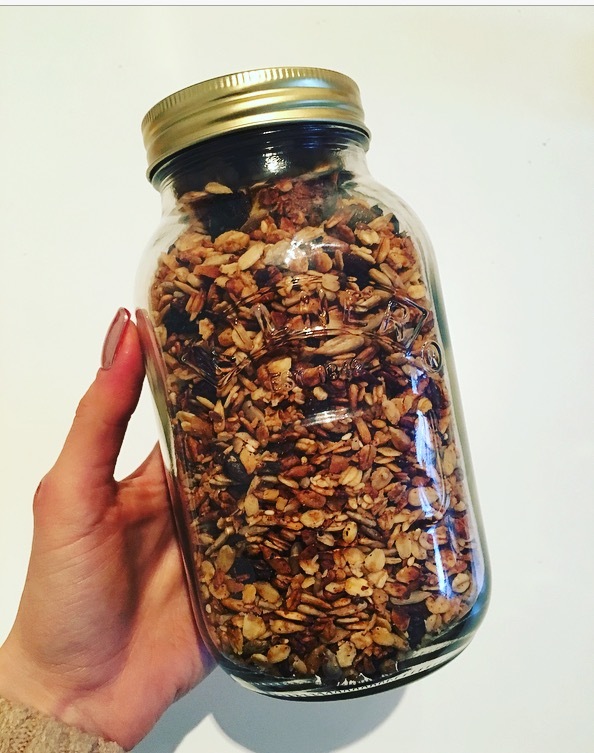 However cereal is still such a comfort food for me, and I know I’m not alone in that, which is why I’ve made this granola which has a far lower sugar content that supermarket cereal, or even ‘healthy granola’ you buy at the organic shops. Preheat the oven to 180 degrees and Melt the honey & coconut oil on a low heat until combined. Put all the remaining ingredients in a large bowl and add the oil & honey mix. Stir well, and then pour onto a lined baking tray and into the oven for 20 mins. Stir it around Every 5 minutes or so to stop it from burning. Allow to cool and then tuck in!